The annual "Bring Your Kid to Work Day" is coming up again, and you really want to participate this year. 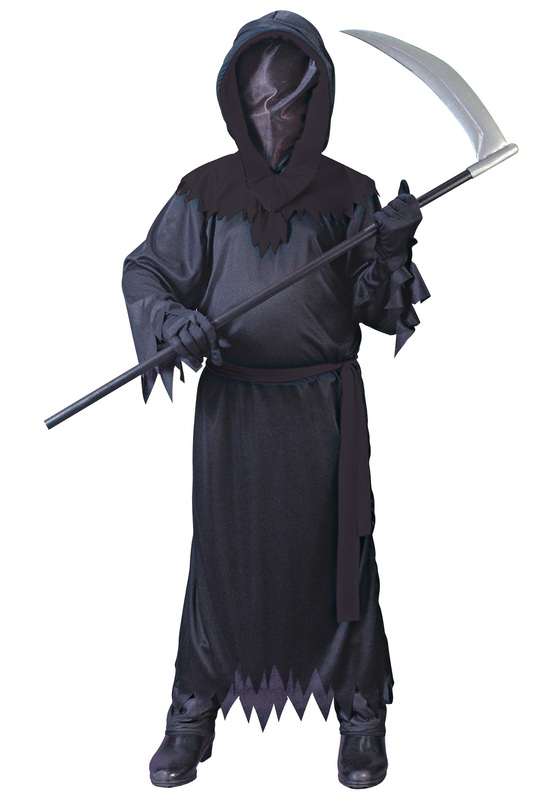 In fact, you've wanted to participate every year, but it's kind of tough when you're the Grim Reaper. It would normally be awkward to bring a kid along with you on a typical day of collecting souls, but it doesn't have to be that way anymore. Because we've got a way that you can finally have Reaper Junior participate and learn what his dad does for a living (or a dying, rather). Just suit him up in this spooky Child Black Faceless Ghost Costume and let the fun begin! It's got everything he needs to mirror (or shadow) his old man as he takes the living into the underworld for eternity. The long, flowing black robes have the jagged edges appropriate to the reaping profession, and the hood will make him look like a medieval executioner (we're starting to think your job has quite the dress code!). But there's one key difference: it includes a face mask with a screen that only he can see through, so it'll be as if there's nothing but darkness beneath that hood. Because if a reaper didn't scare the heck out of people before taking their souls, well, he wouldn't be much of a reaper! So whether you're a Grim Reaper who's just dying to take his little one along on Bring Your Kid to Work Day, or you just want your kid to have a really creepy and terrifying Halloween costume, the Child Black Faceless Ghost Costume is a must-have. Scythe not included!